The leaves of Acer rubrum are simple, opposite and palmately-lobed, as is the case for most of our maples. 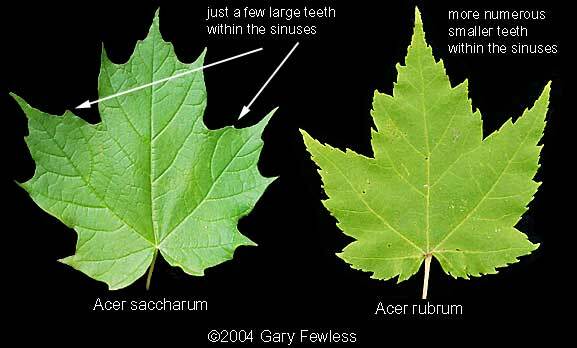 The leaves tend to have shallower lobes than Acer saccharinum and they have more or less regular and numerous teeth inside the sinuses, unlike Acer saccharum with only a few large teeth in each sinus. The name "Red Maple" is well-deserved, as the fall leaves, buds, flowers and often the young samaras tend to be red. A. rubrum flowers early, usually in April. Acer rubrum ranges from the maritime provinces of Canada to Florida and west to Texas and Minnesota. It is a native species in Wisconsin, distributed throughout the state in a wide range of habitats, but it does best in wet or dry forests (not as prominent in mature mesic forests).